If I can bring all of this together, it will go a long way toward proving correct Ted Butler's theory on JPM's current corner of the Comex gold futures market. The certainty of a very large and significant UP move for gold in the very near future. I did not set out to prove or disprove Ted's assertions. After following the Comex gold and silver deliveries these past 60 days, simple curiosity led me to do some research on recent delivery patterns. What I found not only piqued my interest, I think it proves Ted correct. And again, IF TED IS CORRECT, then there is most certainly a very big move coming in gold. So, let's start here: After taking into their house account (again, this means stopping the metal to themselves, into their own, proprietary account) 280 of 3,922 Dec12 silver deliveries, 970 of 2,526 March13 silver deliveries, a big fat zero of 3,416 May13 silver deliveries, JPM stopped to themselves 2,824 of the 3,444 July13 silver deliveries. That's 82%. For obvious reasons, this anomaly got my attention. As I've been chronicling here all month, this trend continued into the August13 gold delivery period. Last Thursday alone, the final day of August deliveries, the JPM house account took down 154 of the 164 Aug13 gold deliveries. This brings their monthly total to 3,151 of the 4,075 contracts delivered. That's 77.3%! What's more, after the initial surge of 1,962 deliveries on the 1st and 2nd of the month, the JPM house account claimed for itself 1,945 of the 2,113 remaining deliveries. That's 92%! With this as inspiration, I went back and reviewed the previous delivery months for gold on The Comex. These delivery months in 2013 have been February, April, June and now August. What I found is startling. Let's start with February. Before we begin, recall that for every buyer, there is a seller...and...for every person or entity taking delivery, there is an issuer from whose vaults that metal will flow. Further, keep this in mind...If you have been naked shorting paper contracts all month, you stand the risk that the entity on the other side of your trade will stand for delivery. So, it follows that, when we see one firm taking consistently taking delivery and another firm consistently issuing the metal, we can deduce who has been shorting all along and who has been buying. Does that make sense? I hope so. If it doesn't. then please re-read that info before proceeding. It is critical that you understand this. OK, back to February. During that month, the Feb13 contract was in its delivery period. What initially caught everyone by surprise was the sheer volume of deliveries. After just 3,253 in Dec12, a month which is usually one of the biggest delivery months of the year, the delivery total for February surged to 13,070. Of that total, the DeutscheBank house account took 5,917 and the HSBC house account took 4,879. Between the two of them, they accounted for 82% of all Feb deliveries. And just whom was issuing this metal? JPMorgan. For the month, JPM issued 7,854 of the 13,070 delivery requests. That's 60%. Also getting in on the act was Scotia. They got clipped for the issuance of 3,644 contracts. That's 28%. So, the DB and HSBC house accounts took 82% of the deliveries while the JPM (house and customer) and Scotia house accounts supplied 88%. And don't forget, this was a lot of metal! Thirteen thousand and seventy Comex contracts is 1,307,000 troy ounces, which equates to 40.6 metric tonnes. After getting clipped for 3,644 deliveries in February, Scotia immediately went on to warpath to get that gold back. For the month of March, the Scotia house account took in 3,383 deliveries while at the same time issuing 179. All totaled, Scotia net deliveries were 3,204 of the 4,229 deliveries for March. That's 76% and, if you take that away, you're left with just the typical 1,025 March deliveries. (Actually, it's not that typical. The Barclays customer account took 834 of the 1,025.) Oh, you're probably wondering which firm provided the metal for all those deliveries? JPM. For March, JPM issued 1,813 out of their house account and 2,209 out of their customer account. That's a total of 4,022 or 95% of all March deliveries. The next month is April and, once again, it's a delivery month. The surge in total deliveries continued as 11,632 contracts were delivered to eager buyers. Of those, HSBC was again the big winner with 3,954 deliveries into their house account. Scotia took 3,292 and Barclays got in on the act with 1,276. Between the three of them, these proprietary house accounts combined for 73% of all April13 gold deliveries. And who got stuck with the bill? DB paid out 992 and Scotia paid out 595. This left the balance with none other than JPM and they issued 9,690 contracts or 83%. 5,990 came out of JPM house and 3,700 came out of their customer accounts. Again and just for fun, 9,690 Comex settlements means that JPM had to ship out another 969,000 troy ounces or 30.1 metric tonnes. Finally, this trend repeated one more time during the delivery month of June. For the month, 9,869 contracts were delivered. Once again, HSBC grabbed the lion's share, moving 4,935 (almost exactly half) of the deliveries directly into their house account. The Barclays house account took 2,000 and, for the first time since last December, the JPM house account claimed 547 or 5.5%. Issuing? You guessed it. JPM issued 7,425 or 75% while Barclays and DB added about 1,400. HSBC House Account: 13,768 deliveries. Total issuance: One. Yes, you read that right. One. Can you see what has transpired here? Desperate to cover and eliminate their 50,000 contract short position but not wanting to do so through the actual buying of futures contracts for fear of disrupting the building price collapse, JPM decided to eliminate most of the position by settling and closing the short contracts in physical metal, instead. They likely made this decision in the expectation of re-acquiring the metal in the near future at lower prices. So confident were they in this eventuality, they even used customer gold to settle more than half of these obligations. The month of June marked the bottom for the manufactured "correction" with price beginning the month at $1390 before trading down to a low of $1179 and closing out the month at $1224. Price has since continued to recover to a last of $1375. Not coincidentally, June was also when Uncle Ted first noticed the change of position for JPM and he reported it in early July after reviewing the Bank Participation Report changes from June. Ted got me all worked up so I did some of my own research and wrote about it here. (https://www.tfmetalsreport.com/blog/4824/amazing-cot-and-bpr-gold) The gist of it is this: After years of being net short, the U.S bullion banks were net long, so much so that on the July BPR, they were suddenly net long almost 45,000 Comex gold contracts! This trend then continued onto the August BPR (https://www.tfmetalsreport.com/blog/4929/reconciliation) which showed the four largest U.S. banks to be net long an astounding 59,473 contracts. On the BPR dated 2/5/13, the 4 U.S. banks had a combined net short position of 69,300 contracts. After five months of deliveries and a $500 price drop, the 4 banks had flipped to 59,473 contracts net long. Now, go back up and reconsider all of the delivery totals listed above. Can you connect the dots??? If not, I'll do it for you. JPMorgan decided late last year to rig the gold market lower in order to create the ideal conditions under which they could flip a 50,000 net short position to a sizeable net long position. Price, delivery notices and the CFTC-supplied reports document that they accomplished this feat by covering and delivering shorts while at the same time initiating and buying longs. They have no doubt been on the buy side of the record-setting Large Spec selling: https://www.zerohedge.com/news/2013-05-22/they-better-pray-there-no-short-squeeze. If this is the case, and JPM is now net long a massive amount of gold futures, we should expect a complete change in the recent delivery pattern on The Comex. Instead of JPM being the primary issuer, they should be the primary stopper. Additionally, instead of the other banks being the stoppers, they should now be the issuers, particularly the non-U.S. banks as the August BPR showed them to have a net short position in excess of 22,000 contracts. And what has happened this month? Exactly that! As stated above, of the 4,075 total contracts deliveries in August, and noting the huge dropoff from the volume of the three previous delivery months, 3,414 were stopped by JPM with 3,151 specifically designated for the JPM house account. And which firms have been issuing? Deutsche issued 1,116, Barclays has done 447 and Scotia accounted for 463. That's a total of 2026 or 49.7%. Note that all three are non-U.S. banks! To me, this proves that Ted is correct. Not only is JPM net long the entire 59,473 shown on the August BPR, their position is likely even higher, offset in the net total by a net short position held by the other three U.S. banks included in the report. And now...finally...here's the rub. The Big Kahuna. The Grand Finale. JPM is likely going to want back most, if not all, of the 3,193,900 ounces of gold that they delivered earlier this year. (16,758 customer + 15,181 house = 31,939 contracts = 3,193,900 troy ounces = 99.341 metric tonnes of gold) But the other banks aren't budging...at least not yet. There were only 4,075 total deliveries in August! And note that HSBC has taken delivery of 13,768 contracts so far in 2013 while delivering just ONE. And who is HSBC??? Yes, they're an English company but what do the "H" and "S" stand for? Do you really think that they are going to be in any hurry to return this 1,376,700 ounces of gold to The Comex and JPMorgan??? I'd say that this is pretty unlikely. Think about it. If HSBC would have simply played ball and handed back to JPM the 4,935 contracts that it settled to itself in June, total deliveries for August would have been at 9,000 not 4,000, a pace that would have matched February, April and June. Instead, total delivery volume came in at just 4,075 and JPM was left grasping to deliver any contract it can get its grubby little hands on as the final two delivery days saw JPM House stop 395 of the 419 remaining deliveries (19 out of every 20). So, most importantly, what happens next? Right now, the total open interest for the typically slow delivery month of October is just 23,758. Of that total, how many do you think are held long by JPM? 5,000? I'll guess we'll see when the deliveries begin next month. More significantly, the total open interest of the December contract stands at 229,838 (that's 60% of the entire Comex gold complex) and this is where JPM likely holds the majority of its net long position. If that's correct...and it most likely is...what the heck is going to happen in December? Is JPM going to simply roll into the Feb14 and the Apr14 OR are they going to stand for delivery AND, if they stand for delivery, are they going to attempt to extract 20,000 contracts or more worth of gold from the other BBs? And if the other BBs get wind of this, are they just going to sit idly by and wait to deliver or will they begin to move net long before it even gets that far? And then you're only left with Spec Shorts who don't have the capability to deliver 2,000,000 ounces of gold because they don't have it. They're just short the paper! All of this could and should set off a buying frenzy/short-covering spree like no one has ever seen. Not only could and should price move higher in the weeks and months ahead, it should move dramatically higher, catching nearly everyone (except the readers of this site) by complete surprise. Of course, all sorts of unforeseen events could come along and derail this plan so caution is always warranted. War could erupt in the MENA. Another Financial Collapse could materialize. Maybe India really will dump 200 metric tonnes onto the market. Any of these things could happen and nullify this forecast. However, I firmly believe that it is highly likely that this plays out almost exactly as I've described above. I hope you're ready. Prepare accordingly. Let's head this off right here. In my opinion, the pattern thus far in Sep silver actually confirms what I've laid out above. For the first two days of Sep silver deliveries, a month which is usually considered "light" ahead of the very busy December, there has been a total of 2,303 deliveries made and the JPM house account has claimed exactly ZERO. In fact, JPM is the big issuer again, settling 1,354 of the 2,303. What the heck does this mean? In June and early July at the price bottom, JPM was attempting to reduce their net short position in silver. From a high in excess of 40,000 contracts last autumn, Ted Butler estimated that they were able to get it down near 10,000 in late June. The deliveries that JPM house took in July were an extension of this. When price turned in July and August, JPM resumed their role as the primary naked shorter in their attempts to suppress price. Ted confirms this in his analysis of the numbers and these delivery totals confirm this, too. We're now into the Sep delivery period and JPM (as a big short) is providing the metal, just as they had gold in Feb, April and June. Thanks for the research & write-up Turd. Have a safe and family-filled weekend people. See you in the funny papers . . . I must say, between this data, the podcasts and dailywrap with JimW and JimC, the KWN stuff, there is soooooooo much fantastic data between them! My 1000 words essay on the ME. I am printing 20 copies to disseminate to friends and family and betting it will do absolutely no good. I may not agree with all that you say but that's ok. In this world of lies where there is very little trust for anyone in authority, I pencil you in as one of the good guys! Obama now asking congress for their approval to bomb Syria! does this mean that he is now looking for a way out? "I still think that WAR is likely over the weekend. Maybe not quite the certainty that it was yesterday at this time but still likely, nonetheless. There's still a chance that Milhous will back away by claiming that "he must get approval from Congress before acting and Congress won't grant it, therefore it's not his fault that we must stand down at this time". But those war-mongering French (now there's an oxymoron!) seem determined to push forward so it's likely that Milhous will, too." TF, the picture you painted is quite different for gold and silver on Comex. JPM got raided for gold, tanked the price to get it back, and then HSBC apparently didn't play the naked short game and consequently didn't give back the gold they got from JPM. Now JPM is net long and will probably stand for a lot of that gold. That had the net effect of moving gold east, probably into official "HS" coffers. Then JPM puts its biggest vault up for sale, presumably because it doesn't need it to store anything, and the gold it gets delivered now is going into its proprietary house account stored who knows where. Now, what about silver? The SLV movements have been pretty minimal till the last couple of weeks where there were large amounts received from just 3 days (5.209 moz). On the first two delivery days, 2,303 deliveries were made in silver, yet registered (dealer) silver rose to 42.668 million oz and the total of all silver was 163.771 million oz, but you say gold is where it's at and silver is just along for the ride. Why the difference? Is there just too little silver to worry about? Are they trying to move all the gold out of the coastal regions in New York and London so it will not be lost, but the silver concentration along the coasts is not nearly the problem that gold is? You know they consider silver valuable, because JPM has more rabidly shorted silver than gold until recently. Their nefarious dealings have been more exposed in silver than gold, and silver seems to have been harder to control than gold has been, because it has been more volatile. I just wonder what they are up to. JPM is anything but stupid. If HSBC had shafted JPM, JPM did not have to play along like a dummy and deliver those massive amounts of gold for those subsequent delivery months. It's likely they intended to move that gold to HSBC, and we are not going to see it come back, ever. Higher gold prices? I don't see how it can be avoided if physical is being hoarded in China and India. The mines are shutting down and demand is going up. If people want delivery, paperware won't cut it. I still don't know the game they are playing with silver. JPM is sourcing it from somewhere in over a million oz per shipment. Maybe just ancient silver dishorded from legacy vaults and just enough so they can keep things going and maintain schedule. Things could get real interesting after Merkel's reelection. So, if JPM corners the gold market, and sends the POG to the moon, do we all become JPM lovers? Just asking. In Laguna Tuna Ville, we call that Switch Hitting on the Wild Side. Next post: The puss is looking for the out, or good faith attempt. Ever since the police powers act, or whatever its called, presidenst perfected military adventurism, while congress was AWOL, buying nanny granny votes using the federal purse, with full court political pandering. Both aspects totally screwed up. The senate should work with the president to set reasons for war declaration, having the time to quickly fully consider war moves, with abolished federal social programs, but for 100 years of political pandering and trashing of the US Constitution, its have been totally messed up. Hope all is enjoying their weekend holiday, checking out the newpaper headlines out the corner of their eyes. Like I said Barry has painted himself into a corner. Rank amateur failed community organizer. Hypocrite extraordinaire. DMH, I noticed that you are talking about O being a amateur. That was the theme that WHI pursued during his latest interview with Ulsterman. However, Ulsterman was discrete enough not to point out to the thoroughly chagrined WHI that the White House "amateurs" cleaned his clock, ate his lunch, and took him to the cleaners during the last election. I, for one, am hesitant to call this administration "amateurs" when they seem to accomplish whatever they set out to do, whether it's by hook or by crook. I think they are an extremely dangerous adversary, particularly should they ever feel like they are backed into a corner. Whither silver, if not with gold? I understand the set up Turd describes is for gold. But does silver ever trade in a different direction from gold? I mean, when the Hunt brothers tried to corner the silver market, it briefly spiked separately from gold, but other than that, it seems to me the daily charts are almost always the same in direction, with silver generally having bigger percentage moves. So will the fact that the BB's are short silver be of any relevance when the big short squeeze in gold happens? Seriously, looking for opinions here. The National Security Agency/Central Security Service (NSA/CSS) leads the U.S. Government in cryptology that encompasses both Signals Intelligence (SIGINT) and Information Assurance (IA) products and services, and enables Computer Network Operations (CNO) in order to gain a decision advantage for the Nation and our allies under all circumstances. We will protect national security interests by adhering to the highest standards of behavior. Lawfulness–We will adhere to the spirit and the letter of the Constitution and the laws and regulations of the United States. Honesty–We will be truthful with each other, and honor the public’s need for openness, balanced against national security interests. Integrity–We will behave honorably and apply good judgment as we would if our activities were under intense public scrutiny. Fairness–We will ensure equal opportunity and fairness in Agency policies, programs, and practices. Accountability–We will be accountable for our actions and take responsibility for our decisions, practicing wise stewardship of public resources and placing prudent judgment over expediency. ... and it keeps going on and on like that! Can you believe it? That someone wrote that with a straight face? This is part of the reason that I am skeptical about the more wild varieties of conspiracy theory: because it is so unnecessary. Just the plain unvarnished facts are usually incriminating enough. How does the JPM potential Comex gold position compare to the revelation that GS holds an enormous position in GLD? How much possession of potential physical deliverable gold could either JPM or GS take delivery of and what is the dollar amount of their holdings? Just wanted to note, that it is believed that Syria was part of the old french empire, and so, France is rather conflicted at times, modern wussies and historical emperors, and explains the skytzoid metality of the french. 1925 Great Syrian Revolt: Revolts started against French rule. Hypocrite extraordinaire.?? LMAO!!! You go dude!! Cowboys and Panderers and a trashed Constitution fueled by political pandering. A Republic? Meh, for which the flag should stand, in stead we have SF gays jamming it down the throats of Oklahoma folks, AZ cant defend itself from the invading hoards, TN folks are taxed to pay for NY homeless, nation wide tax and spend and take and give all according to ability and need. Its a union alright, a soviet union, as power concentrates more and more in DC. The republic is dead for all intends and purposes in the USSA. BHO Proposes New US National Flag!!! The Evil Empire, Dems, Reps, Supreme Court, Banksters and Greedsters. The Black Death of Freedom in the United Socialistic States of America. BSB/FED wants their gold back, and US bullion banks will get it from non-US bullion banks, best guess. Alan, whether something is enough or not is in the eyes of the beholder. On my part I want the truth. If the truth leads to conspiracy theories, then so be it. I don't disqualify a theory just because it's wild. The theories of the false flags of the Gulf of Tonkin, the blowing up the Lusitania, and the explosion on the USS Maine were pretty wild, but they turned out to be true. But I don't believe everything I read, because I believe there are liars, paid disinfo agents, and just plain fear mongers, but I do believe that truth is often stranger than fiction. Let the chips fall where they may, but don't have a willing suspension of belief just because something seems pretty unusual. it would appear they were selling before they were buying, driving the price down (stay with me, it gets better). But buying and selling shares should have nothing to do with the actual holdings of gld. Only redeeming shares and taking out the gold should do that. Goldman Sachs is, of course, one of the authorized participants of the trust, so when they sell they are either selling secondary market paper shares they had to buy, or paper shares they basically simply created, in collusion with HSBC. When they buy, as an authorized participant, they create baskets of shares, which involves physical gold leaving HSBC's holdings and 'moving' into gld's holdings. To begin creation, the AP calls in order to BNY Mellon, the trustee of GLD. From there, the AP must deliver London Good Delivery (LGD) bars of gold to GLD’s trust, held by the trust custodian HSBC. LGD bars must contain 350-430 troy ounces, but most often appear in the form of 400 ounces, and be a minimum fineness (purity) of 995 parts per 1,000 (99.5%) [see also Physical Gold ETF Inflows: GLD Takes Commanding Lead]. Each AP must establish an account with HSBC in order to create and redeem shares of the fund. As far as the creation process is concerned, the AP must transfer physical gold from HSBC to the trust’s account in exchange for baskets of shares. Once gold is transferred to the trust, it is wholly owned by the trust and no other party can make a claim on that bullion, ensuring the safety of GLD’s gold. The trust only holds 100% allocated gold and that gold is never traded, leased or loaned. So when there is an outflow of gold from gld, someone must be redeeming baskets of shares, no? And there are only so many APs, the first alphabetically being ABN AMRO, which is also interesting. But it seems that Goldman Sachs is using gld to syphon physical gold out of HSBC's vault. And wouldn't HSBC have been aware of this flaw in the plan when the trust was established? Or am I missing something here? It seems like there's more than meets the eye and one hand washes the other type thing. It's the timing also. JPM apparently sold quite a bit of GLD also according to that SPDR data link I put up earlier in another thread. Paulson can't be that stupid...repeatedly. They've got everyone coming and going on both sides of every trade and they're also the market mover just by virtue of the sheer size of their positions. One of the destroyers off Syria is the USS Barry. Is this the USS Barry Sotero, named after the president ? Our other presidents get aircraft carriers named after them, while O'bummer only gets a destroyer . Plus they use one of his aliases instead of his muslim name. What kind of discrimination is this? Daystar: on the nature of "wild"
"The theories of the false flags of the Gulf of Tonkin, the blowing up the Lusitania, and the explosion on the USS Maine were pretty wild,"
No, they weren't. Those were just routine claims and routine denials of the claims. Nothing "wild" about claiming, for example, that the North Vietnamese were NOT aggressors in the Gulf of Tonkin, when the government was claiming that they were. Evidence was presented by both sides. The argument raged for some time. Eventually, one side won. In contrast, there IS something very very wild about claiming, for example, that saucers are about to land on the white house lawn, or that Bill Gates is involved in a vast conspiracy to depopulate the planet, or that every single thing that Obama does is carefully calculated to do the maximum damage to the U.S. (i.e. that Obama is some sort of satanic entity, dead-set on utter destruction of this country). Those claims ARE really, truly WILD; the last two are paranoid. There will be no real evidence presented for these things, because there isn't any. There will be no real argument about these things, because no real argument is possible; such claims stem from such deep irrationality that real argument is impossible. No one will win, because there will be no argument. The people who believe such things will continue to believe them, even if presented with contradicting evidence, because the origin of their belief is pre- or extra-rational. China says historical title supports its maritime claims. But did it really have sovereignty? Will Iran Lash Out at Weak Israel? As far as the “jurisprudence evidence” is concerned, the vast majority of international legal experts have concluded that China’s claim to historic title over the South China Sea, implying full sovereign authority and consent for other states to transit, is invalid and illegal. The historical evidence, if anything, is even less persuasive. There are several contradictions in China’s use of history to justify its claims to islands and reefs in the South China Sea, not least of which is its polemical assertion of parallels with imperialist expansion by the United States and European powers in the eighteenth and nineteenth centuries. Justifying China’s attempts to expand its maritime frontiers by claiming islands and reefs far from its shores, Jia Qingguo, professor at Beijing University’s School of International Studies, argues that China is merely following the example set by the West. “The United States has Guam in Asia which is very far away from the U.S. and the French have islands in the South Pacific, so it is nothing new,” Jia told AFP recently. 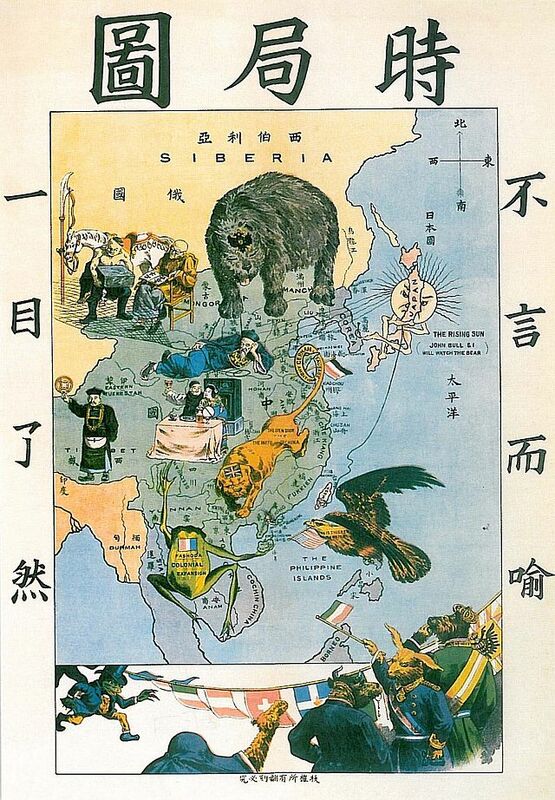 Imperialism in China around 1900 --with the bear representing Russia intruding from the north, the lion representing the United Kingdom in south China, the Gallic frog representing France in southeast Asia, and the American eagle representing the United States approaching from the Philippines. On the eagle is written "Blood is thicker than water", a reference to U.S. Navy Commodore Josiah Tattnal’s saying in 1859. CAIRO (Reuters) - A "terrorist" staged an unsuccessful attack on a container ship passing through the Suez Canal on Saturday, in an attempt to disrupt the flow of ships through the waterway, the head of the Suez Canal Authority Mohab Memish said on Saturday. The Suez Canal is a key global shipping line. "The attempt failed completely and there was no damage to the ship or the containers it carried. The situation was dealt with strictly by the armed forces," Memish said in a statement. The statement did not specify what kind of attack it was but shipping sources told Reuters they heard the sound of two explosions as the ship passed through the waterway.